Peter Jablonski, född 1971 i Lyckeby, beläget strax ovanför Karlskrona. Peter Jablonski, born 1971 in Lyckeby, located just above the Karlskrona. 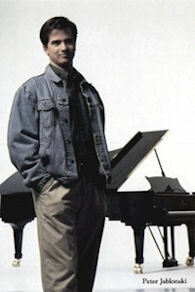 Peter is a concert pianist and conductor with many awards. 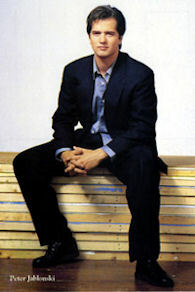 Also has a brother, Patrik Jablonski (born 1974). Peter started playing drums when he was five years and participated in a lot of festivals. Here you can see him at the Pori Jazz 1984 with the song Take a train. Peter on youtube . He began playing piano at six years of age. Interest classical music and piano playing took over more and more and the drums ended up in the closet. But you never know, maybe they come up again. Since its debut in Washington DC, 1992, Peter has worked with many of the world's finest orchestras, including the Los Angeles Philharmonic, BBC Symphony, DSO Berlin, Leipzig Gewandhaus, Tonhalle Zurich, Orchestre Nationale de France, La Scala Philharmonic and the NHK Tokyo. Peter has had many famous conductors including Riccardo Chailly, Myung-Whun Chung, Charles Dutoit, Valery Gergiev, Vladimir Ashkenazy, Daniele Gatti, Kurt Sanderling and Esa-Pekka Salonen. Peter is a talented individual of great stature and have recently appeared in Seol, Bonn, Paris, Tokyo, Stockholm and New York. He has also embarked on a career as a conductor and has conducted a number of European orchestras. Was granted 2005 with the medal Litteris et Artibus of the Swedish king and living now with her family and cat in London.